Back in May, we first reported that Goldman became the first bank to dare to ask if the Fed has lost control of the market, if in slightly more polite terms of course. 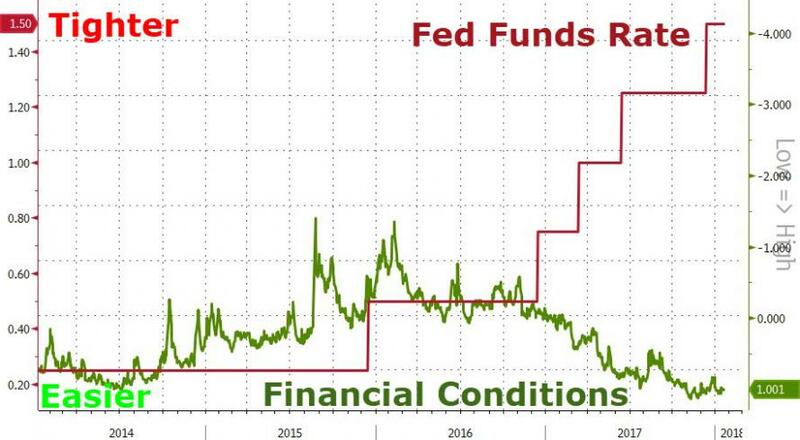 This is how Jan Hatzius phrased it: "Despite two rate hikes and indications of impending balance sheet runoff, financial conditions have continued to loosen in recent months. Our financial conditions index is now about 50bp below its November 2016 average and near the easiest levels of the past two years." 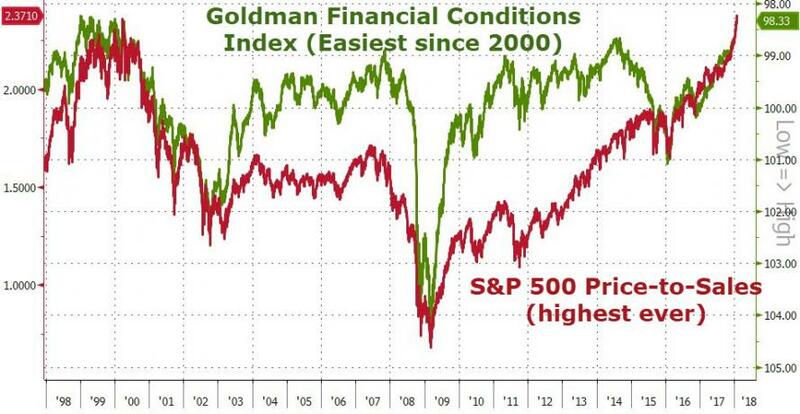 Several months later, after the third rate hike, Goldman found that once again, paradoxically, financial conditions eased further, and the market rose even more in direct opposition of what Fed rate hikes are supposed to do! "Hence a paradox. Even as the Fed has proceeded with its tightening, overall financial conditions have eased. For instance, a standard indicator of such conditions, which combines information from various asset classes, points to an overall easing regardless of the precise date at which the tightening is assumed to have started. Indeed, that indicator touched a 24-year low. If financial conditions are the main transmission channel for tighter policy, has policy in effect been tightened at all?" Which he should be - as The Fed has clearly lost control again. Today's experience is reminiscent of the repeated reassurance of the 2000s' "measured pace", except that the adjustment has been, if anything, even more telegraphed. If gradualism comforts market participants that tighter policy will not derail the economy or upset asset markets, its predictability compresses risk premia. This can foster higher leverage and risk-taking. By the same token, any sense that central banks will not remain on the sidelines should market tensions arise simply reinforces those incentives. Against this backdrop, easier financial conditions look less surprising. Trade accordingly... or as Dalio said "look stupid" holding cash.